Where would we be at for a car equipped like this. I am trying to convince the wife on one… She is not a fan but price matters so I might swing her. Seems like a ton of discounts. Update: Only 15 left. Inventory going fast. Hey I live in PA, willing to come there for a good deal, looking for a 2019 Jeep Grand Cherokee with Lux II package 36/12. Currently in a Grand Cherokee lease with 3 payments left (2015 with Lux II package 29900 miles on it) Anything you can do for me? Thanks! Hey- what would this be taxes rolled in, 0 down? Is it the same packages as the sticker you showed previously? Good morning. Are there any deals on Summit V8? 59,735 MSRP…It’s going to run you roughly $200 more monthly than the advertised one I have here. what is included in the 2bh package? Or is everything listed on the sticker already? also, how much for the 7500 mile a year lease and what are the over mileage charges per mile? Yes, it’s everything listed on the window sticker. $409/Month with only first and plates DAS. Is the payment same for PA resident? Is trade-in taken? No I"m sorry, its only for NY and NJ residents. 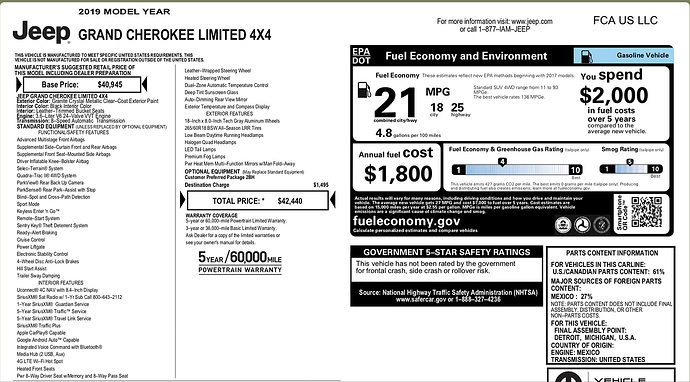 the $409/332 would be the 7500 mile per year lease? Wish Wrangler lease deals got better too. Many dealers have them collecting dust on lots.